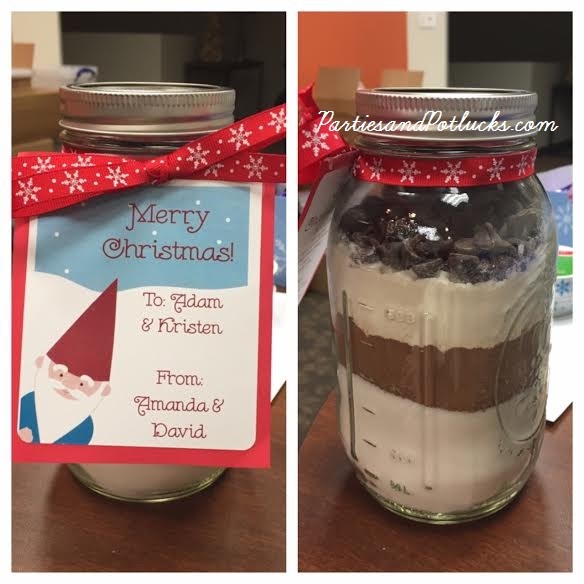 This is the same recipe used in the “Ghirardelli Chocolate Brownie Mason Jars” post. 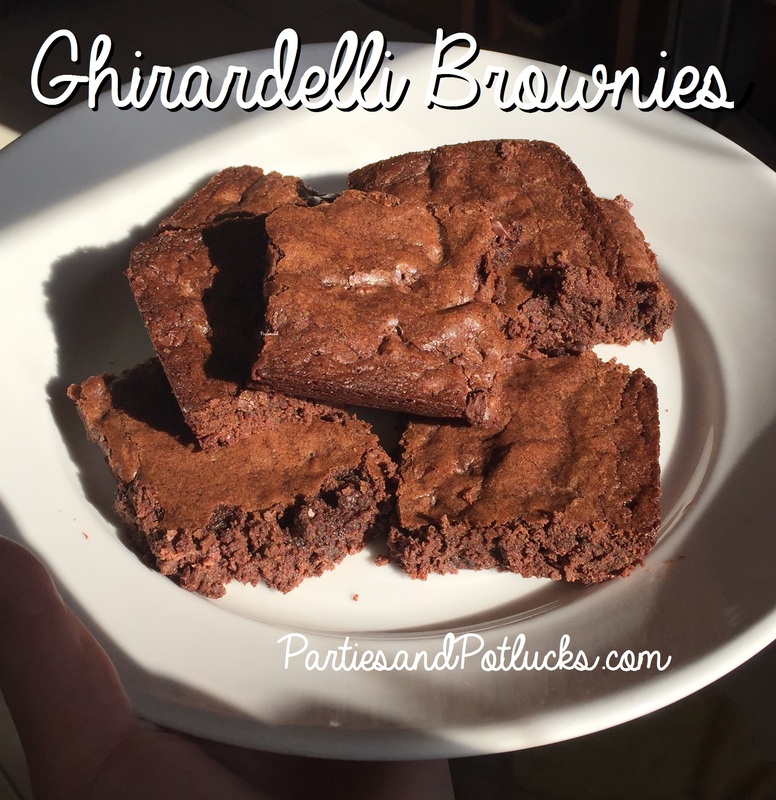 I decided to post it by itself so the friends and family who received the brownie mix can make it again on their own. 2. Beat eggs separately, then mix all ingredients a large bowl. 3. After you’ve mixed it well, transfer to a greased 9×9 baking dish. 4. Bake at 350 degrees 35 to 40 minutes. My coworker, Virginia, loves to make her own popcorn while her husband is out of town on work trips. 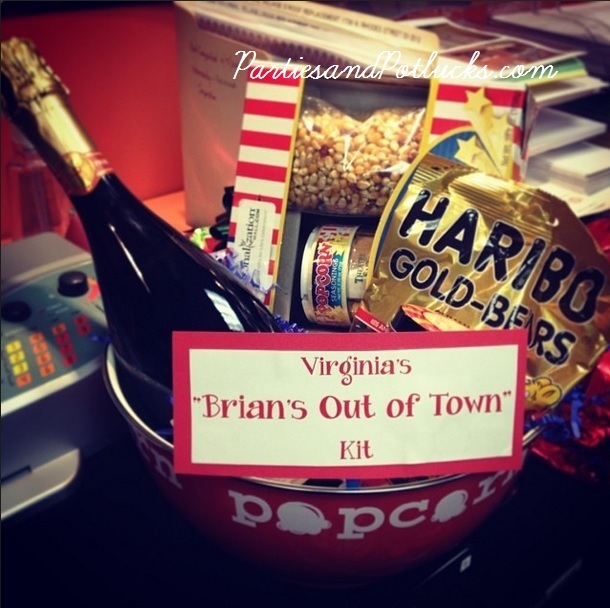 For her Christmas gift I decided to make her a movie night kit for while her husband, Brian, was out of town. It was super easy to throw together and I’ve attached links to everything I bought! 4. White Cheddar Popcorn Seasoning- I bought it from William Sonoma for around $5 but it’s no longer available. You can find seasoning anywhere. For the Sign, I printed it out then glued it to a piece of red construction paper. I taped it to the top part of a bendy straw, shoving the longer part into the bowl filled with raffia. This made it stand out and move where I wanted it! She already had a popcorn maker convenient for the microwave but I saw this one and thought it was awesome! It’s glass so you don’t have to worry about what chemicals might be coming off the plastic containers. It’s $22.50 at William Sonoma, click the picture to see it on their website. 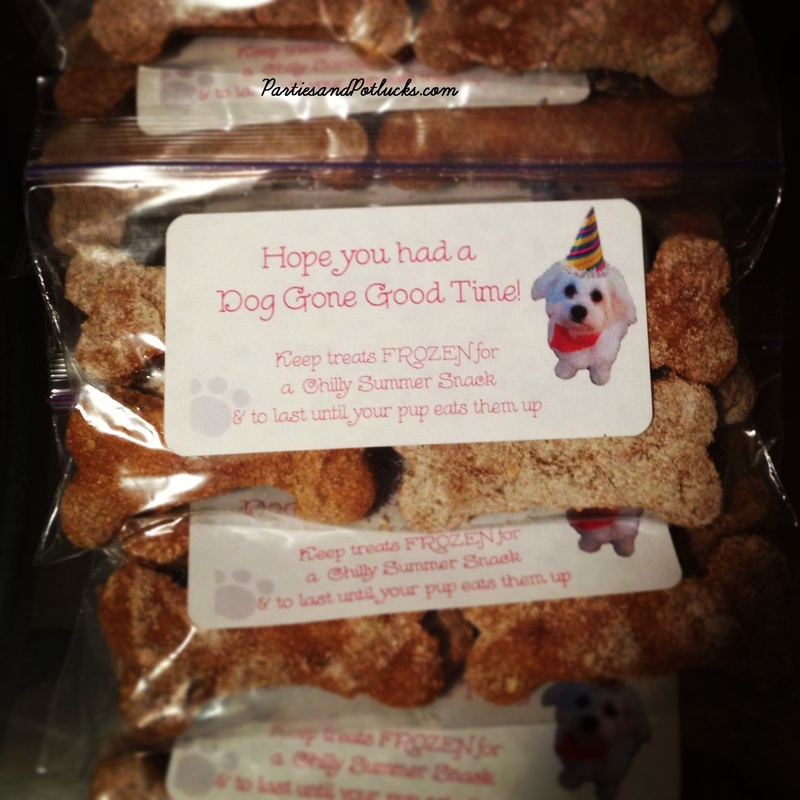 I made these dog treats for my dog, Milly’s first birthday as favors. I recommended everyone keep them in their freezer to preserve them longer, since they only last as long as human cookies. Everyone said their dogs couldn’t get enough! 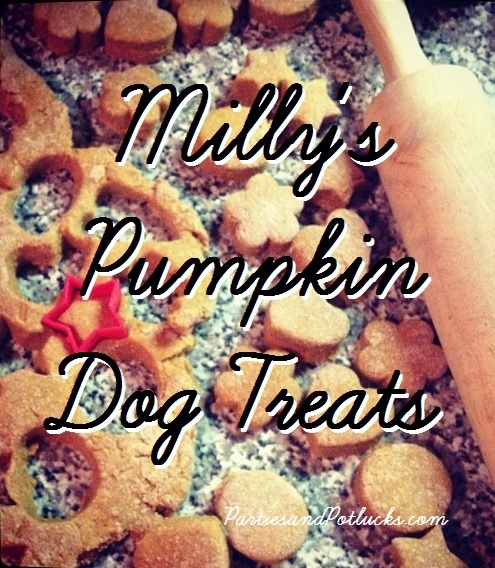 It’s pretty simple and the smaller your cookie cutter the further your treats will go. 2. In large bowl, whisk together eggs and pumpkin. After you’ve mixed it well, add the dry milk and salt. 3. Gradually add the flour while mixing. 4. Once you’ve mixed everything together, move the dough to a lightly floured surface and roll it out. 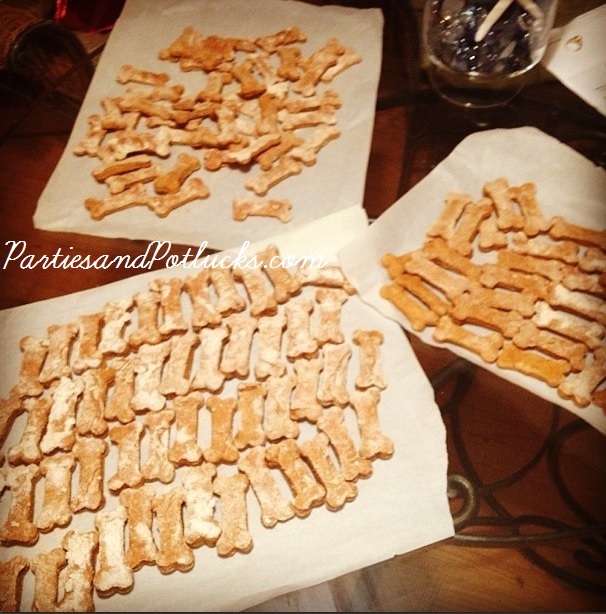 Using your cookie cutter, cut your cookies out and put on a baking sheet lined with parchment paper. Ball up whats left of your dough and roll it out, cutting more until you run out. 5. Bake cookies for 20 minutes. Remove the sheet and flip them over, then bake for 20 more minutes. *You will need a Baster for this recipe, or a large spoon will work. 1. Preheat your oven to 450 degrees. Remove giblets from your hens and rinse them off. Pat them dry with a paper towel and place in a large baking dish (spray with non stick spray). 2. Rub hens with 1 teaspoon olive oil and season with salt and pepper. Place 1 lemon half and 1 sprig of rosemary in the cavity of each hen. 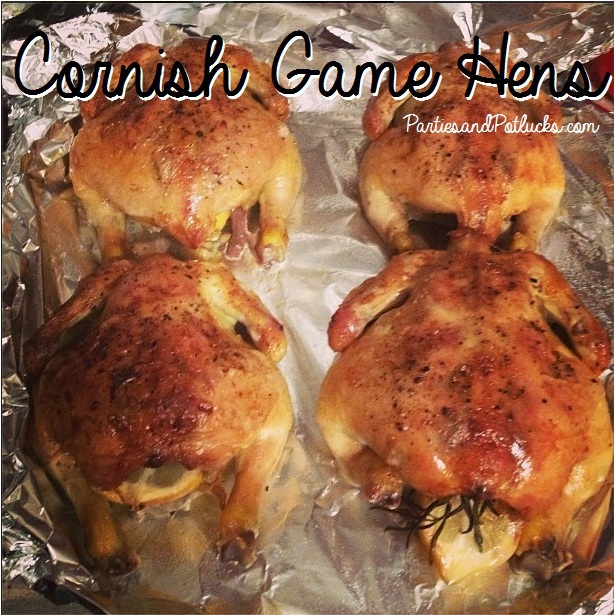 Surround the hens with the peeled garlic cloves and put in the oven for 25 minutes. 3. Reduce your temperature to 350 degrees and mix the wine, chicken broth, and 2 tablespoons olive oil in a small bowl. Pull out the baking dish to pour the mixture over the hens then return to the oven for 25 more minutes. Baste or use a spoon to pour the liquid from the dish on to the hens every 10 minutes or so. 4. Remove the hens from the heat, letting all juices in the cavity drain. Put them on a separate plate with foil lightly covering it and pour juices and garlic from the dish into a pan. Boil about 6 minutes and spoon sauce and garlic on the hens. 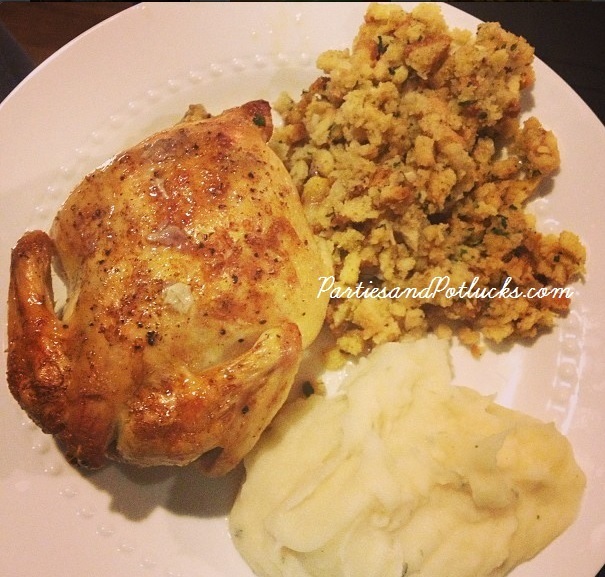 The sauce is great on garlic mashed potatoes! 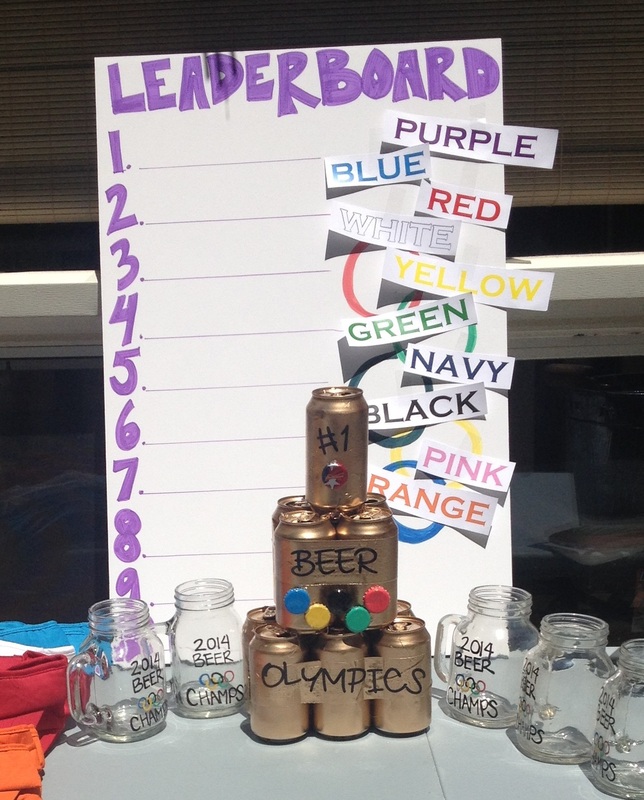 This summer I planned my first Beer Olympics. 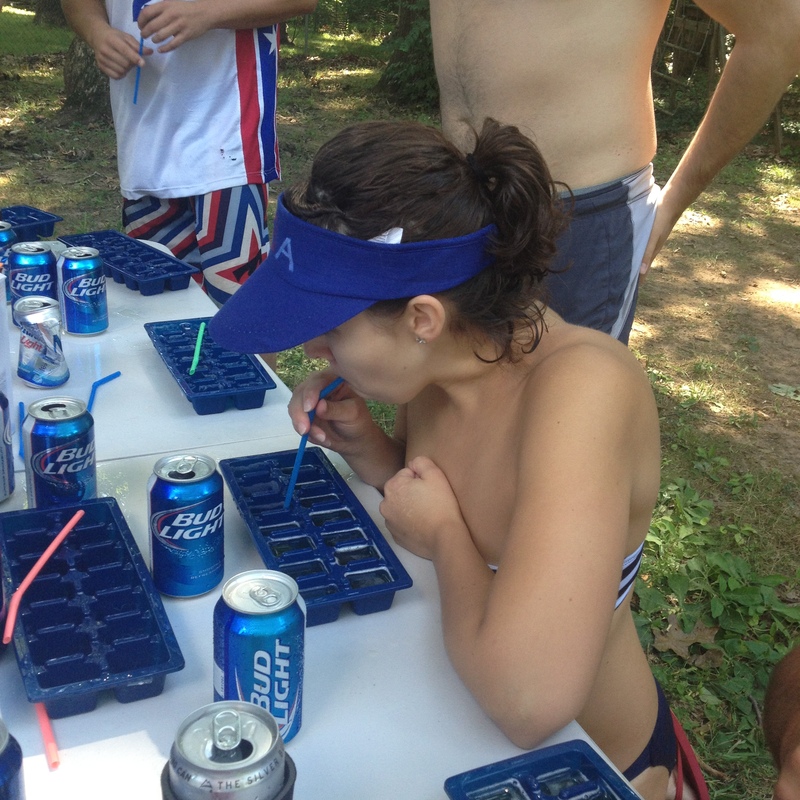 What is Beer Olympics, you ask? 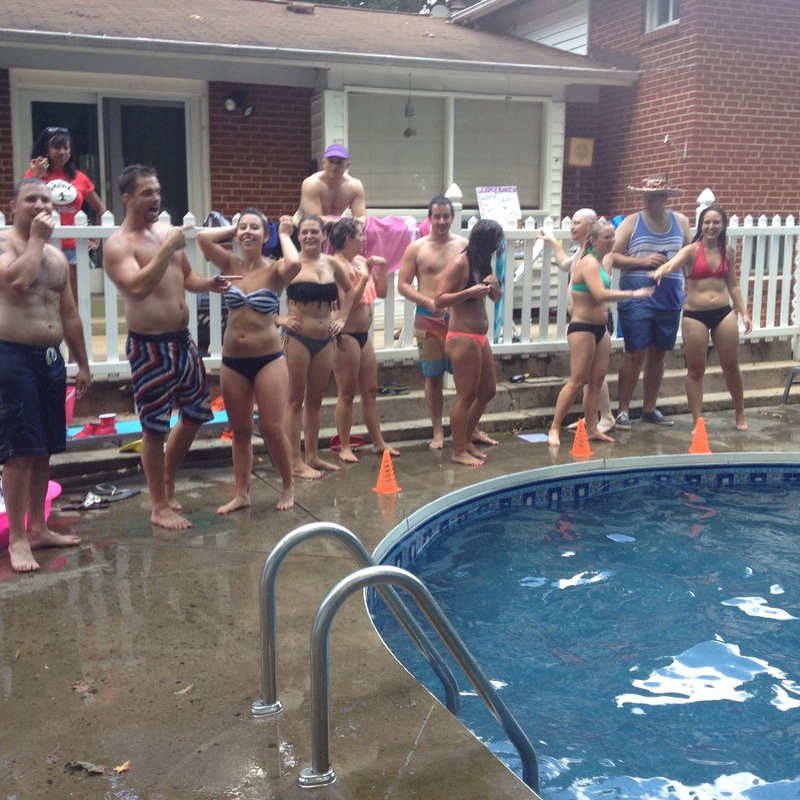 It’s a series of drinking games played by several teams in order to find out who can handle it like a champ. I’m going to run through each game we played, what was needed, and how we did it. While Beer Olympics is usually picking countries, we decided to go by team colors and assemble teams once everyone arrived. That way no one was able to have no shows, and people felt comfortable arriving with only one friend and no pre-planned team. I purchased these colored visors from OrientalTrading.com.There were a few of them that came with the stitching coming out so we just went with the colors in the best shape. I went to Michaels and found these Mason Jar Mugs that were perfect for the winning team’s gift. We made five, since that was the most you could have on each color team. 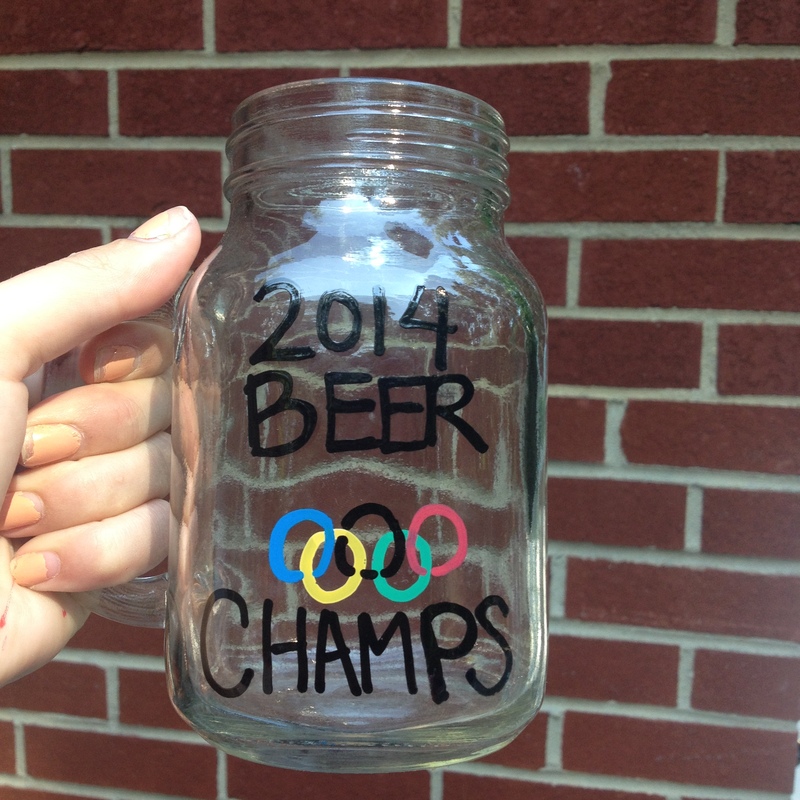 We used Sharpie Glass Paint Markers to write “2014 Beer [olympic rings] Champs.” They were a big hit and everyone really wanted to win to get one. I assembled the trophy, which will remain with the hosts as more of a decoration to take a picture with every year, with beer cans and duct tape. Eleven beer cans with 6 on the bottom, four in the middle, and one on top. I used gold duct tape and hot glue to stick the cans together, sprayed the entire thing with Gold Spray Paint, then used scrapbook letters and beer caps (colored with the Sharpie Paint Markers) to decorate the front. I created a Leaderboard using a Presentation Board so it would stand by itself. I printed out the different color teams on cardstock with a piece of scotch tape on top to easily move it after each round. 1. Each team will have 5 players (depending on the turn out you might want 4 to create more teams). 2. 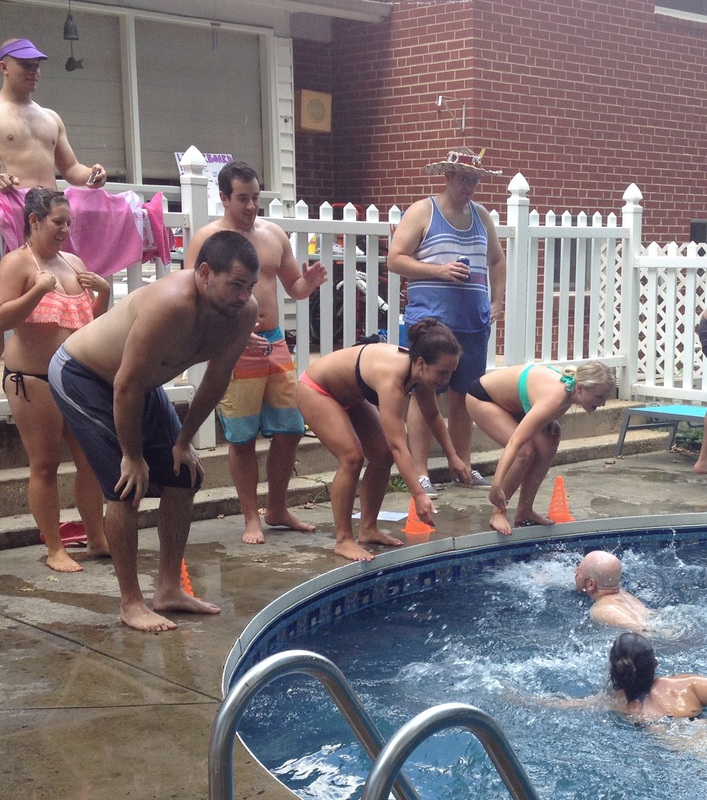 One person per team is allowed to sit out of the pool race, but must have another teammate swim twice in his/her place. 3. Each team will be allowed ONE celebrity opportunity so the late comers (people who can’t come until later in the day but still want to participate) can step in. This is only if a player can’t go on and wants a replacement. 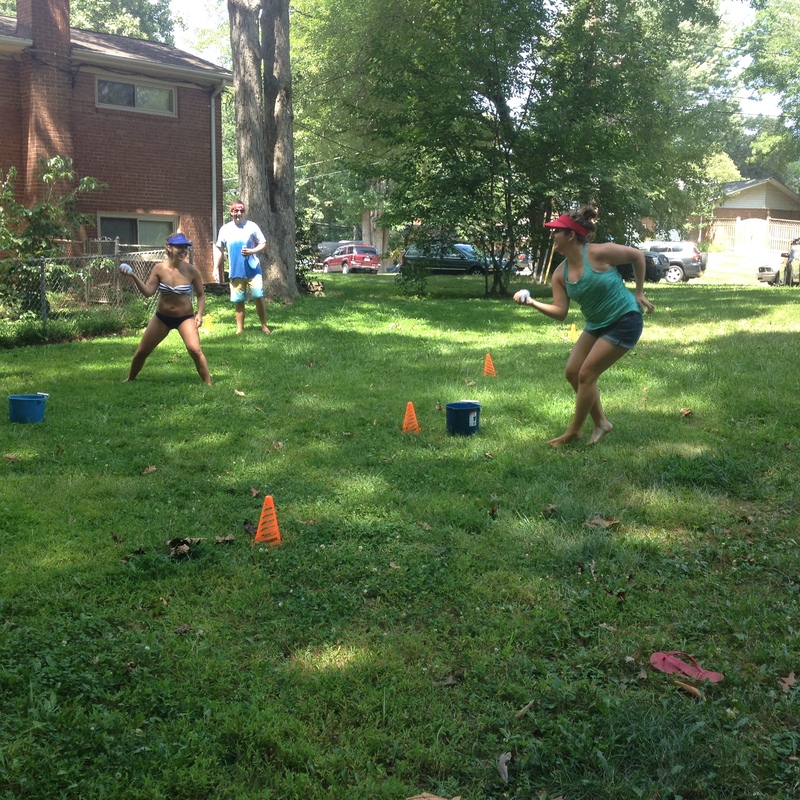 – Each team is given 25 water balloons in a bucket, placed in front of the dividing line. – When you are hit with a water balloon you have to leave the floor immediately and chug a beer. – If you are hit but the balloon doesn’t pop you are NOT out and can use the balloon again. – If someone wants to sit out of this relay their team has the option to let a player swim twice. 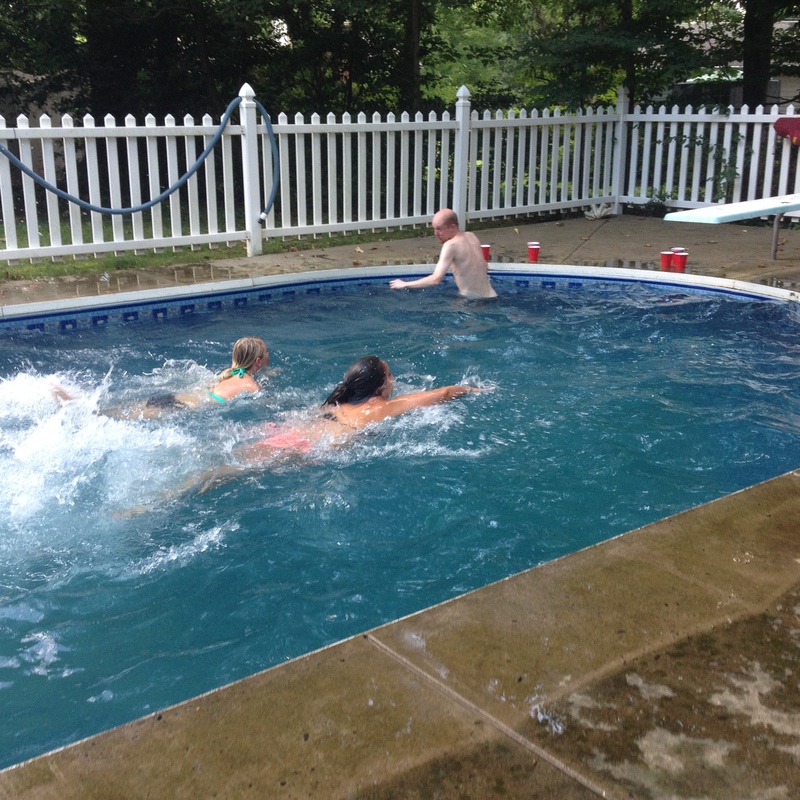 This was definitely the most fun of all the events, obviously we were lucky to have friends with a pool! – Each team will play each other 3 times, best out of 3 wins. – Like flip cup, players cannot go until the player next to them finishes. 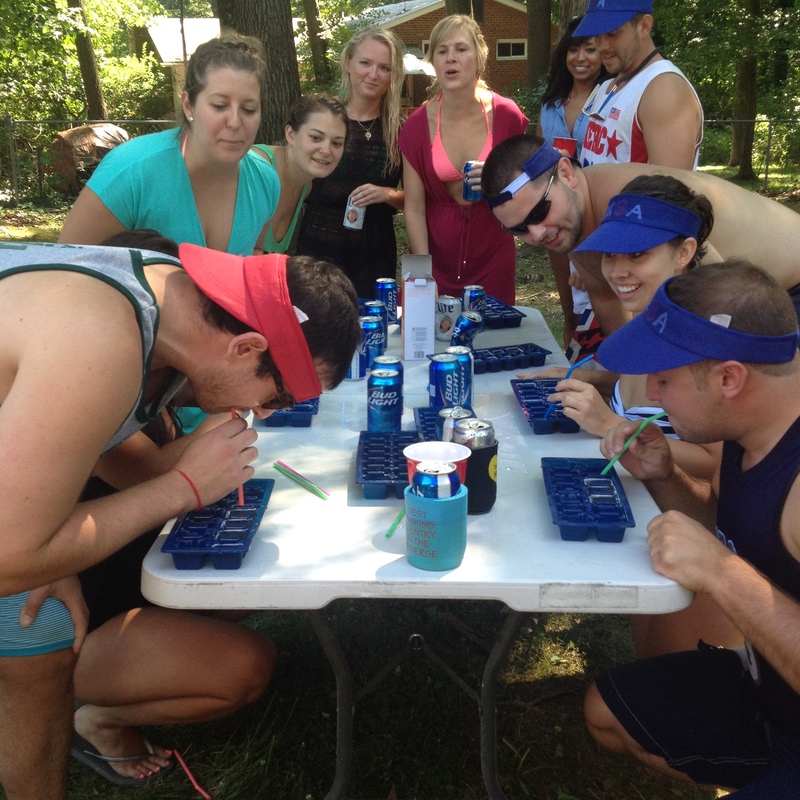 – Each player will drink all the beer out of their trays through a straw. 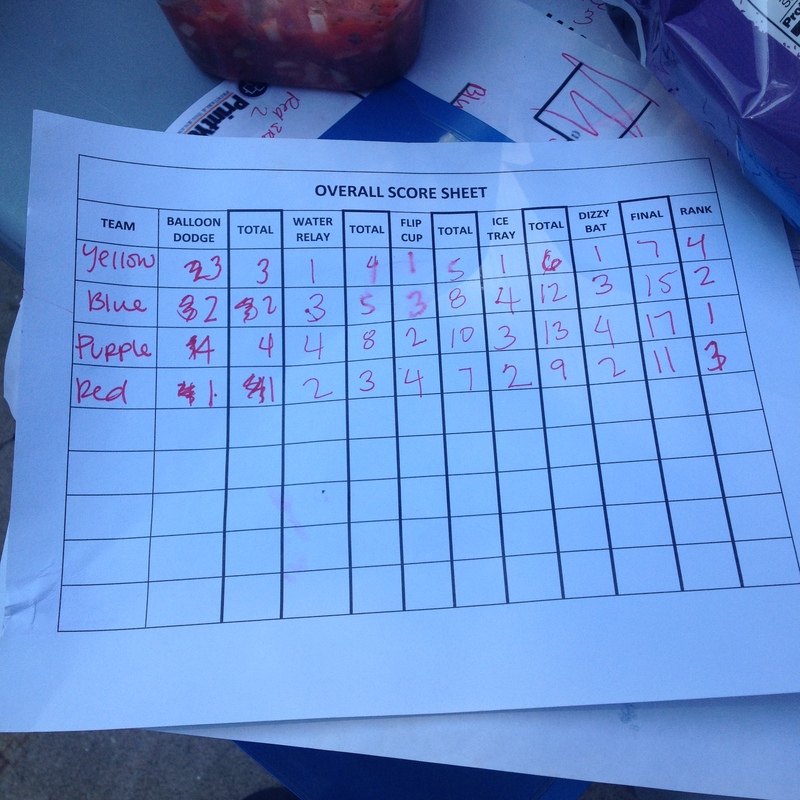 – The first team to completely finish all of their trays wins and moves on to the next round in bracket. – Everyone else on the team must take turns drinking, spinning, and successfully hitting the can. I hate beer and love wine so I gladly took the referee position with my roommate as my co-ref. 1. Measure out each ingredient onto individual paper plates. 2. Fold the plates to create a funnel and pour in each layer. The order I used was 1) Sugar 2) Cocoa Powder 3) Flour 4) Salt 5) Chocolate Chips. After each layer, use your metal spoon to try to even it out and make a smooth line. Flour and Cocoa are the hardest because it sticks to the sides, just make sure you funnel those in as far as you can so it lands in the middle so you can spread it out. 3. 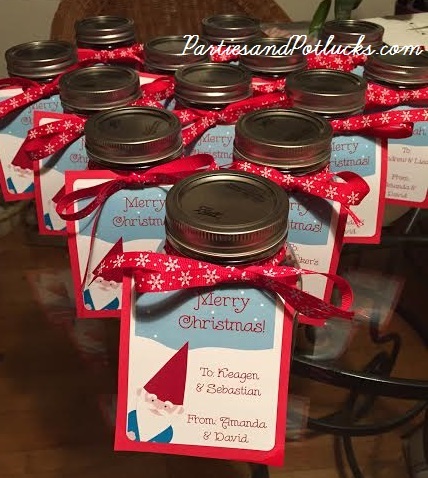 Just add your ribbon and label and you’re done! Don’t forget to add the rest of the directions. 1. Mix jar contents in a large bowl. 2. Add 1 stick melted butter, 3 teaspoons vanilla extract, and 2 beaten eggs and mix. 3. After you’ve mixed it well, transfer to a greased baking pan. 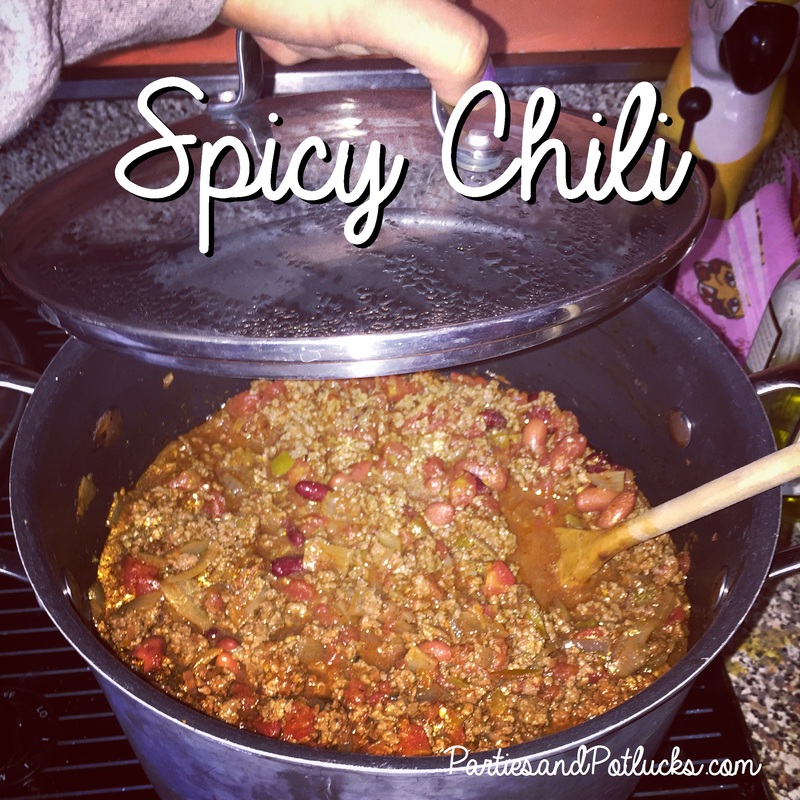 This is the best chili you’ll ever make! You only need one large pot with a lid. The first time I made it I bought diced tomatoes on accident and it completely changed the recipe for the better. 1. Brown the chopped onion in a large pot on high heat. 2. Add the Ground Beef to the onions and mix while browning the meat. Once meat is cooked, drain any remaining grease. 3. Return pot to stove and lower heat to medium low. Mix in the Salsa, Rotel, Chili Mix, Light Kidney Beans, Dark Kidney beans, Garlic Powder, and Garlic Salt. 4. Cover and let it cook for 1-2 hours, stirring occasionally. The flavor is best when it has a couple hours to cook. Drop the heat to low if it starts bubbling. 1. Boil the shells as directed on the package, then rinse under cold water. Preheat your oven to 350 degrees. 2. Brown the turkey meat in a separate pan and drain. 3. In a large bowl, combine mozzarella, ricotta, parmesan, egg, salt, pepper, turkey. 4. Coat the bottom of a large baking dish with the tomato sauce. 5. Stuff each shell with the mixture, just enough to where you can still close it. Line them in the pan as you fill them so they stay closed. 6. Pour spaghetti sauce over filled shells. 7. Cover the pan with foil and bake for 25 minutes. 8. Remove the foil and cook uncovered for 10 minutes. This recipe can feed a crowd! 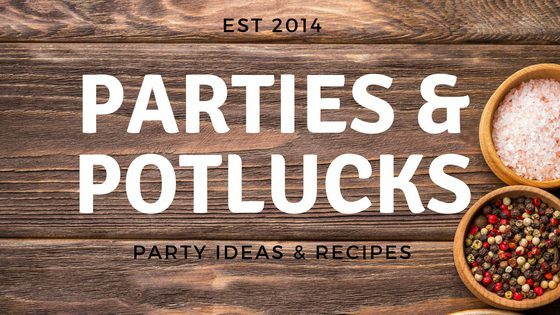 I double the recipe for parties over 20 people as a side, and for crab feasts where people are hungry for the carbs! 2. Separate items into 4 bowls. I find this makes life easier and cooking faster! 3. Bring a large pot of water to boil, add pinch of salt and cook pasta 6 minutes (noodles are still a little hard). Empty water out of the pot as soon as 6 minutes are over and set aside. 4. In a large pan melt ½ stick butter. Whisk in the flour and mustard and keep it moving until it turns a nice “blonde” color. 5. Stir in the Milk, Onion, Bay leaf, Paprika, Salt, and Pepper for about 5 minutes, then remove the bay leaf. 6. Stir in the Egg, Bacon, 1 bag of Sharp cheddar, and the bag of Gouda. Slowly mix in the noodles with a rubber spatula to make sure its evenly mixed. 7. Butter a baking dish then pour in the entire pasta mixture. 8. Top the dish with 1 bag of Shredded Cheddar Cheese evenly spread out. 9. Microwave ½ stick butter until melted and toss the Panko bread crumbs to coat. Top the dish with the buttered Panko bread crumbs. 10. Bake uncovered for 30 minutes until Panko is golden brown. 2. Brown turkey meat and onion in a large pan on medium high heat. Drain remaining grease. 3. Add taco seasoning, sloppy joe mix, Worcestershire, chili powder. Add the tomato sauce then fill the empty can up halfway with water and add it to the pan. 4. Stir and lit simmer for 10 minutes. Cook rice as directed on box in a separate pot. 5. Add rice to meat mixture and mix well. 6. 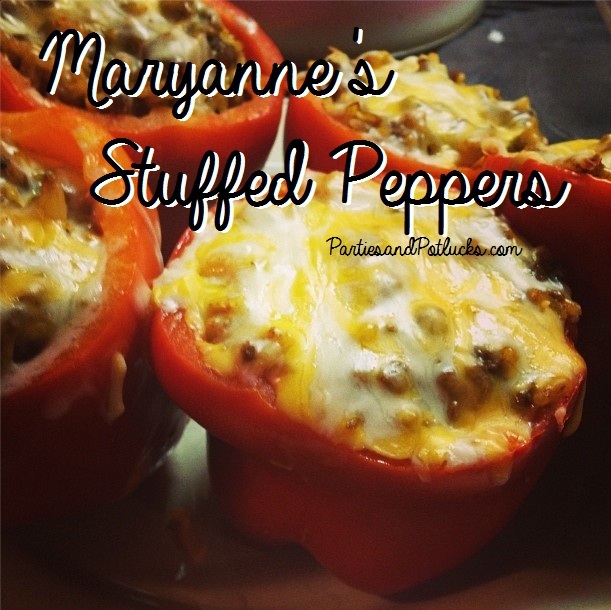 Fill each pepper with the ingredients from the pan and stand them up in a baking dish. Add a cup of water to the bottom of the pan to help steam the peppers. 7. 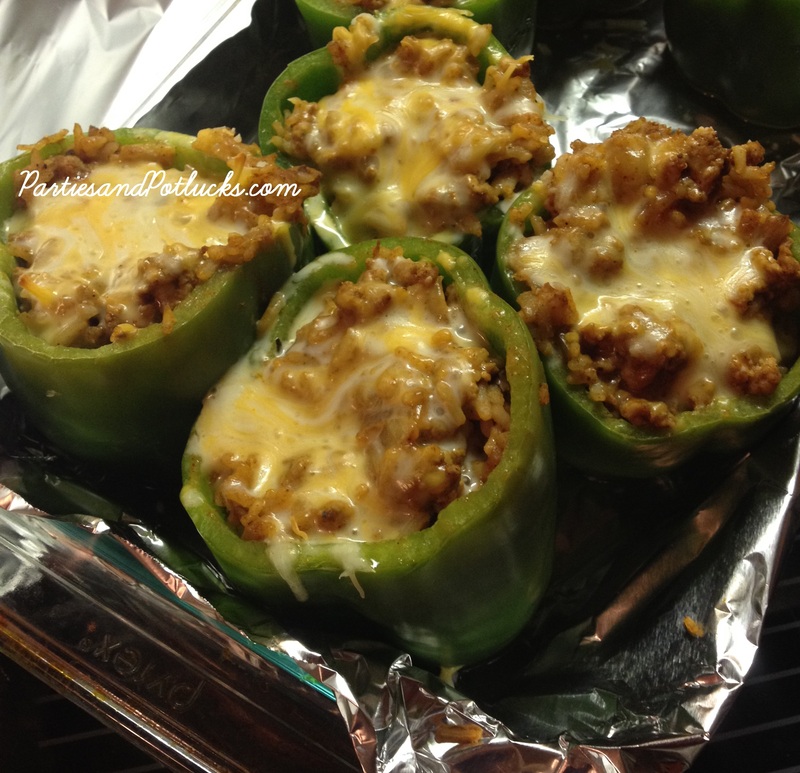 Top each pepper with cheese. Cover the entire dish with foil, I spray the inside of the foil with Pam so it doesn’t stick to the cheese. Cook for 40 minutes. When I make it really spicy I serve it with Sour Cream!